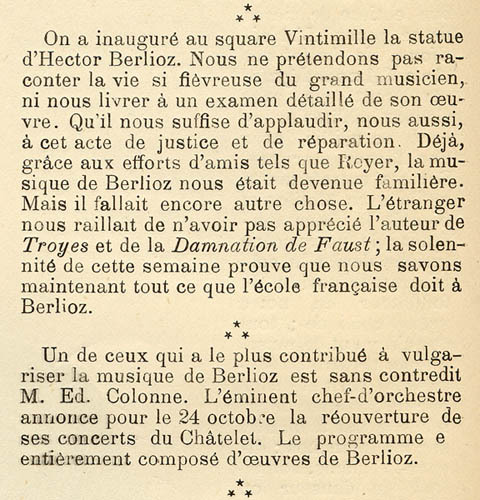 This page presents a report of the inauguration of Berlioz’s statue in Square Vintimille (now Square Berlioz). 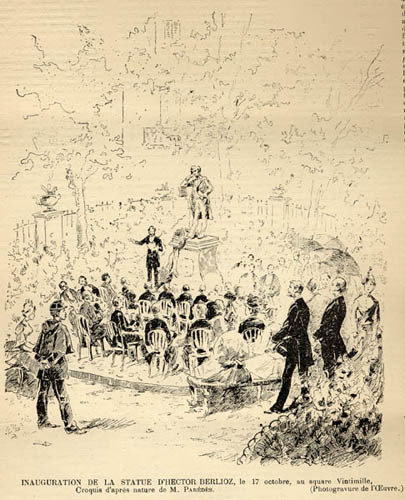 The picture to the right of the text shows Berlioz’s friend Ernest Reyer delivering a speech at the inauguration ceremony on 17 October 1886 (see Square Berlioz). The original text of this report and the accompanying image were scanned from our own copy of the 23 October 1886 issue of La France Illustrée, and are reproduced below together with our English translation of the report. Berlioz’s statue on Vintimille Square has been inaugurated. We do not propose to tell the story of the great musician’s feverish life, nor will we give a detailed assessment of his works. Suffice it for us to join in applauding this act of justice and reparation. Already, thanks to the efforts of friends such as Reyer, Berlioz’s music has become familiar to us. But one further step was needed. Foreigners mock us for not having appreciated the author of the Trojans and the Damnation of Faust; the ceremony performed this week proves that we now know what the French school owes to Berlioz. One of those who have contributed most to popularising Berlioz’s music is indisputably M. Ed. Colonne. The eminent conductor has announced the reopening of his concerts at the Châtelet for 24 October. The entire programme consists of Berlioz’s works. Note: the article contains an obvious error; one of the two works of Berlioz referred to is of course Les Troyens and not Troyes. See also on this site Ernest Reyer’s speech (in French) at the inauguration ceremony, and the pages on Berlioz and Paris: the revival and Édouard Colonne.